Arda lives in a temporary home in Turkey after fleeing with her family from the conflict in Syria. CARE has been providing Syrian refugees living in villages in southern Turkey with emergency supplies including blankets, hygiene kits and food vouchers. Around the world, a staggering 68.5 million people – that’s more than the entire population of the UK – have had to flee from their homes because of war, persecution or instability. Of those, more than 25 million are refugees; 3 million are asylum seekers; 40 million are internally displaced, meaning they have fled from their homes to another area of their country. Every day, 44,000 people are forced to flee their homes because of conflict or persecution. It means that globally, one in every 111 humans is now either a refugee, internally displaced, or seeking asylum. When I was young, my dream was to be an engineer. But with what has happened in my country, that dream didn’t come true. I lost my dream and the dreams of all the young people of Syria, who exchanged their dream for the need to just stay alive now. A boy at Bentiu Protection of Civilians camp in South Sudan during the rainy season. CARE provides health services and water, sanitation and hygiene support to thousands of people at the camp. 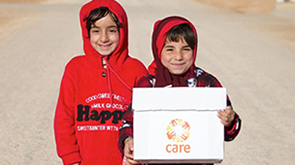 CARE provides emergency support to refugees – such as people fleeing from the conflict in Syria – and to internally displaced people – such as people in South Sudan forced by conflict and violence to leave their homes and live in temporary camps in terrible conditions. We also provide support to people to help them deal with the psychosocial effects of experiencing conflict and violence – particularly sexual and gender-based violence. And we provide long-term support to refugee communities, and to their host communities, so that people can regain some dignity and control over their lives – such as our long-term presence providing education and other support to people who have lived for decades in the world’s largest refugee camp in Dadaab in Kenya. A refugee is someone who has been forced to flee their country because of persecution, war, or violence. An internally displaced person is a person who has been forced to flee their home for the same reason as a refugee, but remains in their own country. People who leave their homes due to natural disasters, climate change, or severe situations such as a lack of food (including famine), water, education, health care and a livelihood, are not legally recognised as refugees. But these people also need support – and CARE is there to provide it. My name is Falmata Ali from northeast Nigeria. I am fighting for my children to grow up.